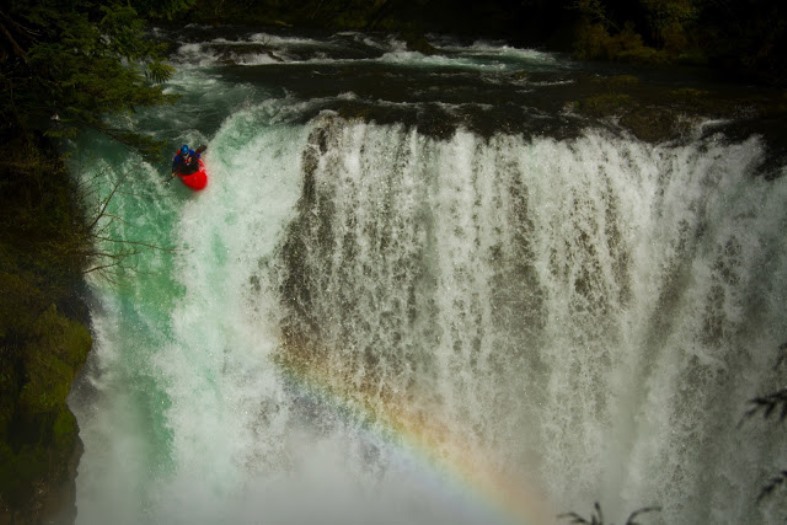 Throwing your paddle off a waterfall is not something you should just decide spontaneously, if you've decided you are going to throw it, you should know it before running. Softer landings, less impact, less probabilities to heart your back (if done properly), it’s safer for your face (the paddle can be dangerous around it), and hands (hands take big impact by holding the paddle), you are not going to break your paddle, and it can be very stylish. Ones you lose your paddle it´s almost impossible to stop going oververt, not recommended if you don´t have a solid hand roll, if you´ve got caught by the hole of the waterfall you ´r gona have a bad time, you need a big pool (not recommended if there is a rapid or waterfall after the drop), you have less control of your boat in free fall. Throwing the paddle is something you should have in mind since you are scouting, you have to take a good look at that waterfall and see the exact point where you think your boat is going to be stable enough to get rid of your blade. There are different kinds of waterfalls, so there are different kinds of techniques. Personally I only throw my paddle when there is a big chance of boofing, or if the volume is not enough for the height. You always have to do slow moves to keep the balance of the boat, only if you are going flat, or you know the drop is going to boof you lean forward as hard as possible to get that bow down and give some angle to the boat with the heaps. Throw the paddle either to a side or up (keep it away from your face). Always try to keep your weight on the front of the boat. There are 2 ways for tugging, one is to lean forward and hug your boat, your helmet should be in contact with the boat, or if there is a chance to hit rock, just lean as forward as you can, like trying reach the end of the boat, always hide your face. Ones at the bottom roll up and celebrate, cause there is a big chance that your line looked sick. I don’t think throwing the paddle is the best option to have a perfect line, and I only recommend it if it’s needed.